Moderne Induktionsanlagen von Ambrell bieten die erforderliche Geschwindigkeit, Genauigkeit und Wiederholbarkeit zur Montage qualitativ hochwertiger Verbindungsstücke beim induktiven Schrumpfen und Dehnen. Mit einem sachgemäß konstruierten Induktor kann die Induktionserwärmung Bohrlöcher homogen erwärmen und dadurch eine genau reproduzierbare Dehnung erzeugen. Induktive Erwärmung liefert zuverlässige, wiederholbare, berührungsfreie und energieeffiziente Wärme in kürzester Zeit. Die zur Aufschrumpfung von Metallen üblicherweise verwendeten Induktionsanlagen haben Leistungen zwischen 1 und 20 kW, je nach Werkstück und Anwendungsanforderungen. A multi-turn helical coil delivers uniform heat to the entire range of the bearing sizes in the transverse mode. The customer was using a cold press, but it was creating part defects. This was resolved with induction heating: the process took just two minutes compared to 40 minutes and they were able to achieve their targeted production rate. Induction's fast, precise heating means the client can count on consistent results once it is implemented into their process. The customer currently uses electric ovens that run 24 hours a day, 5 days per week and their primary concern is to save on the energy cost of heating the parts in the ovens. A three turn helical coil is used to heat the steel valve seat. The steel valve seat is placed in the coil and heated for 50 seconds to enlarge the center hole & drop the carbide ring in for the shrink-fitting process. A three turn helical coil is used to heat the aluminum pulley. The pulley is heated to 464 °F (240 °C) in 20 seconds to expand the inner diameter and then the inner bearing is inserted to form the completed part. Induction heating provides more accurate control of heat vs a flame burner, it heats only the knuckle, not the whole part, it prevents discoloring due to lower temperature used and increases productivity due to repeatability & ease of operation. A foot pedal & timer is used. A four-turn helical coil heats the ring at one end of the assembly. The coil is designed to concentrate the field towards the center of the assembly where the thermal mass is greatest. Processing with induction heat saves power and time. The complete tube does not have to reach the desired temperature as it does when heating with an oven. Being able to selectively heat a zone allows for a much quicker transfer of heat. Heating a camshaft gear with a bore size of 1.630 inch to shrink fit over a steel shaft that has a diameter of 1.632 inch. A temperature of 500F is required for the gear to expand 0.002 inch in order to slip over the shaft. To heat an aluminum fuel pump housing measuring 8 x 45 x 3.5 inch to 375F, allowing steel parts to be inserted. 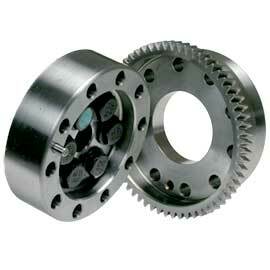 To heat aluminum and steel camshaft gears to over 500°F within 4 minutes for a shrink fitting application. Bei den meisten Anwendungen geht es um einen Schaft mit einem gegebenen Außendurchmesser und ein weiteres Teil, wie eine Ritzel, einen Lenkzapfen oder eine Unterlegscheibe mit einer Lochbohrung. Ambrell bietet auch Lösungen für das induktive Aufschrumpfen von Zahnraden. Diese Art Montage gibt es in zahlreichen Formen, die sich durch die Toleranz (Freiraum) zwischen beiden Teilen unterscheiden. Aufschrumpfverfahren werden für Presspassungen verwendet. 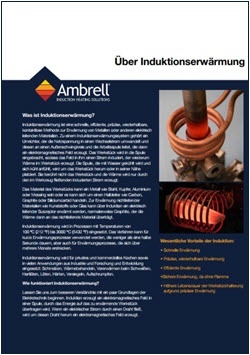 Für das induktive Schrumpfen oder Aufschrumpfen von Metalle wird ein flacher oder spiralförmiger Induktor in das zu dehnende Metallteil eingeschoben. HF-Strom wird angewendet, bis das Werkstück die gewünschte Temperatur erreicht hat. Danach wird der Induktor schnell aus der Bohrung entfernt und der Schaft in das Bohrloch geführt. Das Ganze lässt man dann allmählich abkühlen. Während das erhitzte Werkstück sich zusammenzieht, entsteht Druck. Je nach Masse der auszudehnenden Teile wird manchmal ein pfannkuchenförmiger Induktor verwendet. Generator und Induktor: eine schnelle und genaue Erwärmung erzielt die besten Ergebnisse. Gewähren Sie dem Metallgehäuse eine ausreichend lange Erwärmungszeit, um sicherzustellen, dass die gesamte Masse eine homogene Temperatur erreicht und sich ausgedehnt hat. Verwenden Sie eine Ausrichtungvorrichtung, um den Schaft glatt in das Gehäuse einzuführen.